For many of us women, inviting people into our lives and homes feels like inviting judgement of our entertaining skills and stress on our already maxed-out schedules. But what if you knew that opening your front door was a simple and radical way to change the world? Jen Schmidt is determined to prove it to you. She has set out to reframe how we think about hospitality and to encourage us to walk a road of welcome in our everyday lives. She aims to shatter the image of model homes and model lives, replacing it with relatable, everyday invitations determined to get to know the people around us from more than just a polite distance. When we drop the idea of entertaining, and instead just open the door--just as we are--our guests get to experience the everyday Gospel, our kids grow up in a life lab of generosity, and we trade insecurity for connection. Just Open the Door is for seasoned hosts, nervous newbies, and everyone in between. It is a personal yes-you-can invitation. Through Jen's hilarious fails, personal tales, and practical tips, you'll start to see your home as the most likely location for changing the world around you. 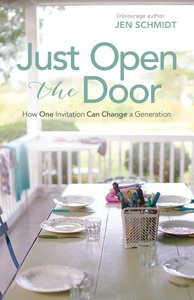 About "Just Open the Door: How One Invitation Can Change a Generation"